The main island is small and easy to explore, with glorious white sand, palm-fringed beaches rewarding you for just a couple of hours’ drive to the North coast and the same to the East, along mainly hopeless but endlessly fascinating roads flanked by simple homesteads, roads worn more by foot or bicycle and frequented by chickens. There is a time warp here, this place where the past is so responsible for the present, where mobile phones, internet connections and television are all relatively recent, and where the history and culture is so imbued that you can simply stretch out beneath the dappled shade of the coconut palms and soak it up. Welcome to Zanzibar, and a world apart. Sailors and traders from the first century AD came to the lands of ‘Zinj el Barr’, the Black Coast, bringing beads, porcelain and silks to trade for gold, slaves and spices, ebony, ivory, indigo and tortoiseshell. They waited for annual monsoon winds to fill their dhow sails and bear them across the Indian Ocean; today’s visitors usually arrive in a small ‘plane or ferry from Dar es Salaam. But these still afford a measured approach, allowing a breathtaking vision of sparkling cerulean waters over sandbanks and reefs, and then into Stone Town, the ancient island capital, still more of a town than a city, a maze of winding pedestrian streets in a hotchpotch of rooftops, a mass of corrugated iron overwhelming the historic stonework beneath. The Arab immigrants were overthrown by the Portuguese in the 15th century, until the Sultan of Oman finally saw them off for good in 1698 and started building the Stone Town of today; the Old Fort on the harbour was built on the remains of a Portuguese church dating back to 1600. Visitors to Stone Town still encounter the grandiose vision and dominant architectural style of a confident young Sultan who transferred the seat of his sultanate from the contentious capital of Muscat to the breezier climes of Zanzibar in 1832, and then began palace building in earnest, and seeding the coconut palms and clove plantations which soon defined Zanzibar as the ‘Spice Island’. Driving through the island centre now, it is worth stopping to explore the spice plantations, where a guided walk for passing tourists is likely to be more lucrative than vast crops to export, but it is a fine sensual pleasure to crumble cinnamon bark straight from the tree, to breathe the scent of cloves drying in the sun, to taste and guess the spice from a handful of pods and powders. These are well used by the chefs and kitchens in beach hotels, where fishermen daily bring the catch of the day to be grilled, baked, battered or blanched with assorted Zanzibar spice. The coast is dotted with hotels, self-contained beach hideaways that relish their privacy and provide various levels of style and comfort. I have been to most and head north by choice, to the northernmost peninsula which is occupied by Ras Nungwi Beach Hotel. The name is a very literal Swahili translation, but it says nothing of how this beach is secluded and the coral sands are blanched very, very pale. It does not tell how the wonderfully translucent and clear the sea is here, where a coral reef surrounds the shore creating a shallow wide expanse to explore until the tide rises high and then turquoise waves crash onto the beach. It is a naturally beautiful place. Turtles come ashore to lay their eggs when the moon is full, and the surrounding reefs are a thriving colourful world to snorkel and dive. 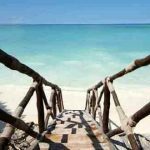 Ras Nungwi Beach Hotel is essentially respectful of its place, each room constructed from local wood and coral rag to create a number of thatched round houses along the beach, with lodge rooms in gardens behind. Soft sand pathways link the central thatched and open-sided restaurant to the rooms, pool and dive centre, providing the comforts of a fine hotel with a rustic, beach hideaway style. This is a fine place to lie back and soak up Zanzibar, crack open a coconut, watch the dhows on the far horizon and look forward to spice-scented, star filled African night.